The word cancer instills many emotions among people. Fear, helplessness, pain, regret and sadness are just a few feelings one may experience when dealing with their own diagnosis or learning of a loved one’s circumstance. Each individual handles cancer in their own way and it may be dependent on many factors. Personality, type and stage of cancer along with strong desire to survive may all affect the outcome of a cancer diagnosis. My father died of brain cancer at the age of 67 and his way of coping seemed to be to accept his impending death with no questions asked. He was a private person who rarely expressed emotions and his cancer diagnosis did not change this nature. I, nor any of my siblings, were aware of the type of cancer he had, if options were available, or if he had done any research into his particular case. It may have been in an advanced stage, but it was never discussed. He never spoke of any information about his cancer that may have helped someone else or his thoughts on his life and death. To me, this appeared like a wasted opportunity. Rhio O’Connor, on the other hand, handled his diagnosis of mesothelioma very differently. Mesothelioma is a rare and aggressive form of cancer associated with exposure to asbestos. The mesothelium is a protective lining that covers most of the body’s internal organs. Malignant cells typically present in the pleura or outer lining of the lungs and the internal chest wall. Many people diagnosed do not live past a year, but Rhio survived more than seven years. Unlike my father, Rhio took a very pro active approach to his cancer. He gained power and control through education. 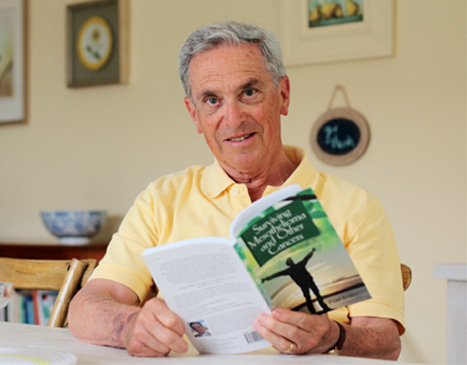 He learned as much as he could about mesothelioma, therapies and options. He researched vitamins and minerals, tailoring a daily pill formula to aid his body. Diet and exercise were also scrutinized and he began a strict program. Being an informed patient, he was able to advocate for his own health and well being. He was an integral part of the treatment plan that extended his life far beyond expectations. Learning about Rhio O’Connor has led me to question what my journey with cancer would be like. I firmly believe that what you put into and on your body matters tremendously and this is where I would begin. In my opinion, there is a definite link to high rates of cancer and our modern world. Whether the link involves ingredients in processed food, daily chemical interactions, pollution or stress we may not know for some time. Therefore, I would further reduce my exposure to unnecessary chemicals and preservatives in food, beauty and cleaning products; I would live as close to the real earth as possible. My diet would be “clean” with plenty of fresh vegetables, fruit, nuts and sustainably produced meat and dairy. Processed food would be eliminated completely. In addition, I would actively learn more about supplementation, immune boosting herbs and anything else that may slow the growth of cancer. With a cancer diagnosis, I would support medical research, volunteering for any trials I may qualify for and hope my efforts help others on the same path. Quality of life is important to me, and I would try to tailor my treatment plan so I would not be constantly drained or sick. Applicable non-profit organizations would be supported through my time and money. My voice would be heard about stem cell research which is needed to find a cure for cancer. Stress, lack of rest and over-scheduling are contributing factors to disease and the America lifestyle amplifies these problems. More so than I do now, I would simplify my life. Frivolous concerns of material possessions would vanish and I would take extra time to travel, sleep, read and exercise my body and mind regularly. Slowing down and being conscious of my world and those in it would take priority. In the end, stuff doesn’t matter. Relationships, experiences and personal growth matter. Rhio’s inspirational story on survivingmesothelioma.com focuses on his determination to beat cancer and live his last days to the fullest with a true understanding of what would ultimately be the cause of his death. He took responsibility for what time he had left on the earth instead of laying down without a fight. Immediately, Rhio reminded me of my own quest for education and purpose in my life. I come from a long line of blue collar workers, employed in jobs but not careers. Neither my parents nor any of my eight siblings attended college. Along the way, I have figured out that it is up to me to step outside the box of what my life was “supposed” to be like. Rhio O’Connor was “supposed” to die within a year of his diagnosis. Like Rhio, we are all in the driver’s seat of our own life. Family, friends and, in Rhio’s case, medical professionals may sometimes ride along but ultimately the journey is decided by us.